Wow, wow, wow! This book was fantastic. I am still in shock over it. It blew my mind because I was a little hesitant on starting this since it was a little over-hyped, but that feeling has washed away completely. I fell in love with every single character in this book. They were portrayed beautifully. Every little detail about them had me wanting more of their back story and everything in-between. Being in the High Fantasy genre I was hoping for a lot of detail and bam! My prayers were delivered. Whenever a character was wounded or broken, I would instantly feel their pain. I cried a lot when their was depressing scenes. It was crazy. Especially at the end. Oh, man, I was crying so hard. Don’t ask why, just go read this book. The world Morgan has created in this book is absolutely beautiful. It has a Game of Thrones feel to it on every page and that is why I love it so much. I can easily close my eyes and picture everything. It makes me want to actually move to one of the places. Hell, I’m already packing. I don’t care if there’s a crazy king. 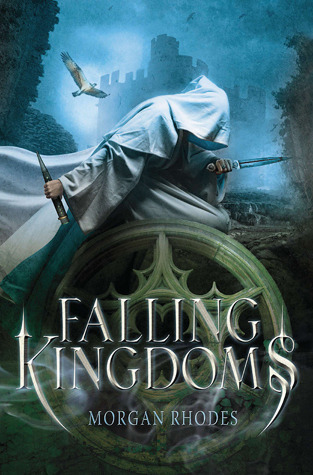 Like in all High Fantasy novels you’ll see the same plot or storyline, however, in Falling Kingdoms, I found the plot refreshing. Sure, it has the same betrayal feel and so on, but deep down this book was better than any other High Fantasy book I have read in the past. This book had me on the edge of my seat most of the time and the rest of the time I was crying my eyes out. I love his this! Definitely deserves more hype.